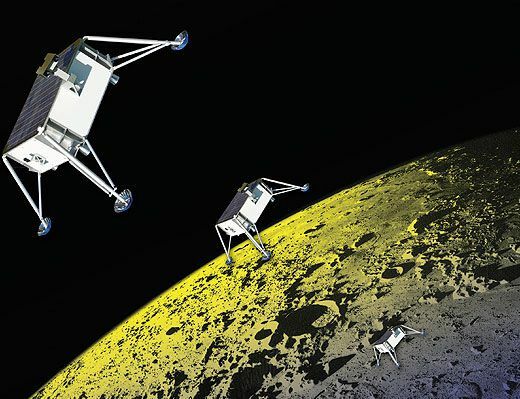 Can a spacecraft hop its way to winning the Google Lunar X prize? 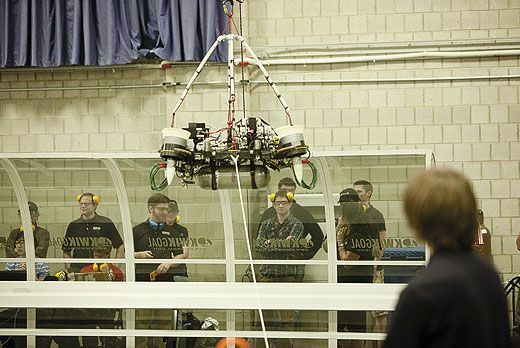 In a windowless two-story room in a Cambridge, Massachusetts laboratory, a contraption of carbon fiber and plywood dangles from a crane in the ceiling, three feet from the floor. The machine is about three feet across, and at each corner, ducted fans point down, at an outward angle of about 30 degrees. They are silent now, but when running, their function is to counteract five-sixths of the pull of Earth’s gravity and allow the machine to simulate operations in the moon’s 1/6 G.
This is the Terrestrial Artificial Lunar And Reduced gravIty Simulator, or TALARIS. 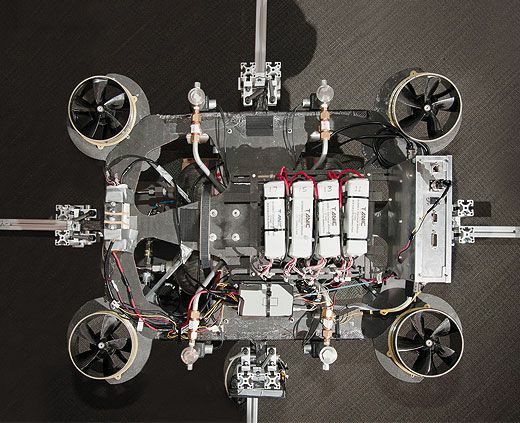 It’s the latest in a series of prototypes built to perfect the technologies for an unusual planetary rover, one that hops from place to place instead of traveling on wheels, the more common way planetary rovers move. 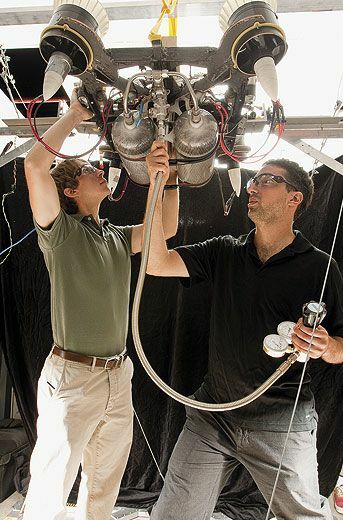 A team of students from the Massachusetts Institute of Technology and managers at Draper Laboratory, where the machine is under development, are preparing TALARIS for a test. After graduate student Christopher Han reads off a safety checklist, everyone retreats behind Plexiglas-and-plywood shielding, where another student, Christopher Rossi, mans a laptop. Draper manager Bobby Cohanim stands at a lanyard, ready to keep the ropes securing TALARIS to the crane from getting sucked into the ducted fans. A thrown fan could present a serious hazard, as could the pressurized tanks under the vehicle, if punctured. Hence the shielding, and the safety glasses everyone wears. The team members also wear big yellow over-the-ear protectors to prevent the roar of the fans from causing hearing loss. “IMU calibrating,” calls out Rossi. Then “Five seconds till fire.” Five seconds later, the fans spin up, sounding like an industrial vacuum cleaner. The torque they produce gently twirls the vehicle stage right, according to plan. Next, cold-gas thrusters—used in place of the rockets of an actual space vehicle for greater safety in Draper’s indoor lab—begin firing nitrogen with an angry hiss, the on-off pulses that modulate the thrust happening much too quickly for the human ear to distinguish. What happens next is definitely not according to plan. The vehicle begins to yaw, swinging with increasing intensity. Rossi quickly hits the command to shut it down. The pressurized tanks hold enough gas for some 30 seconds of operation, but this test ends after only 10 seconds. Han steps out from behind his Plexiglas shield and, using a wooden pole, smacks the big red emergency kill switch on the top of TALARIS. Once Han is out of the way, Rossi sends the command to dump the nitrogen remaining in the lines feeding the thrusters. One final hiss and a jolt, and the vehicle is safe to approach. Grad student Sarah Nothnagel holds a remote-control kill switch. “I didn’t know whether to kill it or not,” she says. “Once there starts to be growing oscillations, it’s done,” says Cohanim as he removes his safety goggles. The team will have to rebalance the precise intervals and durations of the cold-gas thrusters’ firing. THE CONCEPTS BEHIND THE HOPPER originated in MIT’s Practice of Aeronautics class, taught by former space shuttle astronaut Jeffrey Hoffman. 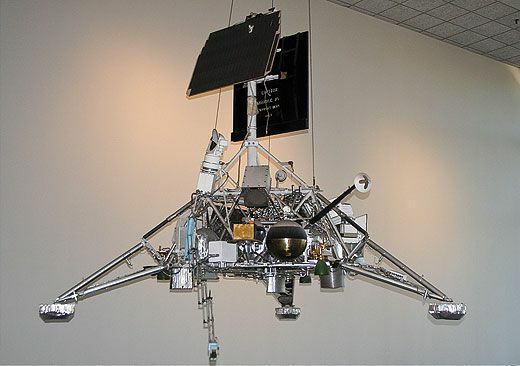 But the impetus for building a working prototype to gather real-world test data for an actual planetary hopper came from the Google Lunar X Prize, which offers $20 million to the first non-government team to land a rover on the moon. More specifically, the impetus for making the leap out of the classroom and into the laboratory came from former U.S. Air Force pilot Michael Joyce, leader of Next Giant Leap, one of the teams competing for the X Prize. The 49-year-old Joyce planned on a career as an astronaut, so he joined the Air Force after college, hoping to become a test pilot. But the Challenger space shuttle disaster of 1986—and the subsequent grounding of the shuttle fleet while Joyce was still in pilot training—put his space dream on hold. After flying Boeing B-52 bombers and training other pilots to fly Northrop T-38 jets, he feared that his dream of joining the astronaut corps was a long shot and that he was facing a desk job. So he left the Air Force and sought another way to scratch his space itch. 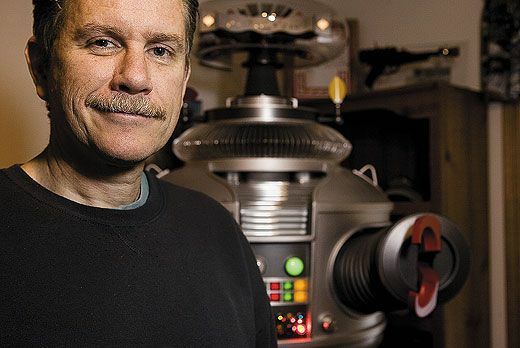 He turned to science fiction, starting a business building full-scale replicas of the robot featured in a TV show he loved as a kid: “Lost in Space.” Each six-and-a-half-foot-tall robot, built in the basement of his home in the Black Hills of South Dakota, features a 240-watt built-in stereo system, which plays new vocalizations by the original robot’s voice actor. Joyce’s robots retail for $24,500, and his customers are mainly fellow “Lost in Space” fans who became successful in tech careers. “I am very moved that I am now able to fulfill my boyhood dream of owning my very own B9 Robot thanks to your company,” says a typical testimonial on the Web site of Joyce’s company, B9 Creations. Joyce has sold more than 50 robots.